Gone to See America. December 2011 Florida Road Trip. Day 8: Merritt Island National Wildlife Refuge. 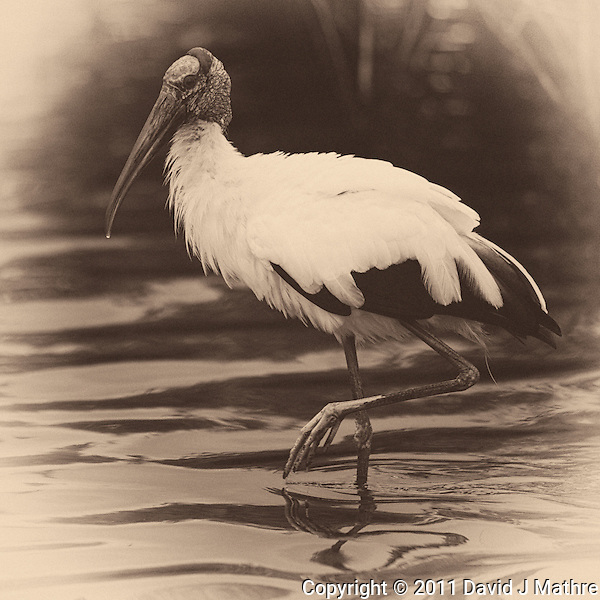 Wood Stork Wading Along Black Point Wildlife Drive in Merritt Island Wildlife Refuge. Image taken with a Nikon D3s and 600 mm f/4 VR lens (ISO 640, 600 mm, f/4, 1/640 sec). Image converted to B&W with Nik Silver Efex Pro 2. Gone to See Cuba 2011 People to People Cultural Exchange. Day 3 of a Street Photography Workshop led by Steve Simon. One of our photography stops was at Rafael Tejo Boxing Gym (Gimnasio de Boxeo Rafael Tejo). I’m really not into boxing. We were supposed to see a boxing match, but the boxing official or medical officer didn’t show up. So we ended up shooting the young kids practicing. After getting back to the US and did some internet searches, I saw that several photography tours stop at this boxing gym as part of the People to People cultural exchange. While there three kids, that were not practicing came up to me and asked for dollars. I gave them Kennedy half-dollar coins instead. Gone to See Portugal. 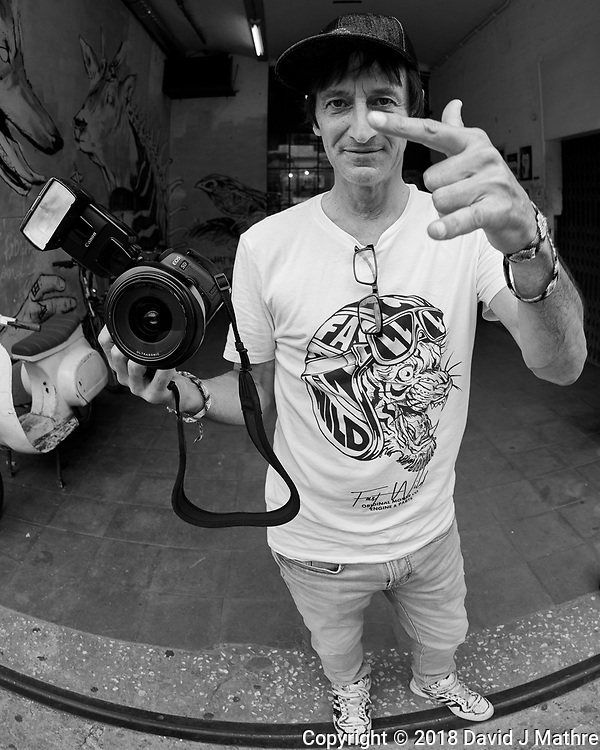 Street Photography Workshop with Steve Simon. 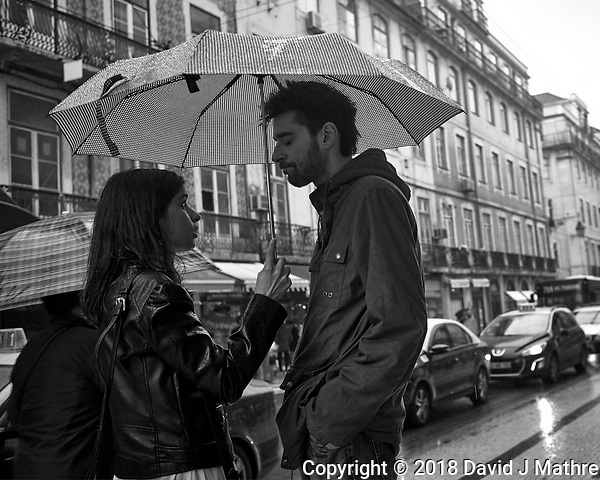 Day 5: Lisbon, Portugal. Miguel took us out for our morning walkabout so Steve could sleep in and allow the antibiotics to work their magic. I took my small Leica CL camera with the 23 mm f/2 lens and the Garmin VIRB-360 camera. We went through an area with many bars with lots of empty bottles and plastic cups from the night before. The only activities were a few locals on their way to work, and the some city workers picking up the bottles and cleaning the streets. I wandered off on a side street and came upon a film crew with motorcycles and police cars doing practice runs. I got a picture of the movie director viewing the activity. We then walked back to the hotel for lunch and our afternoon image review session. 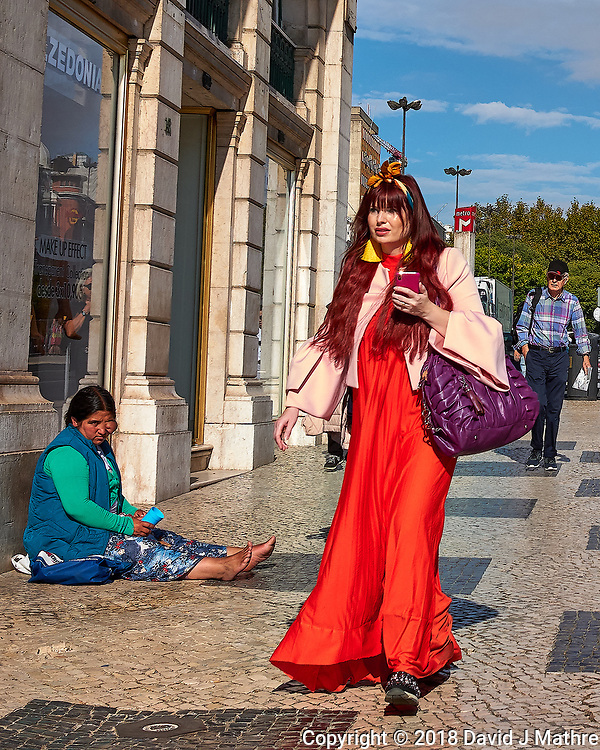 Just before getting to the hotel, a woman with a bright orange dress walked by a street beggar in blue. Time-Lapse Video (360 degree Pano, Tunnel View and Little Planet View) of the Morning Walkabout. Images recorded with a Garmin VIRB-360 camera. For our afternoon session, we rode a couple of taxis to the LX Factory. I took the Nikon D850 camera with an 8-15 mm fisheye lens. The LX Factory is a tourist attraction with many arts and craft shops and restaurants. “Kiss the Cook” a Portuguese cooking class that I attended during the 2014 Semester at Sea voyage is located in the LX Factory.. A commercial photographer didn’t want we to take any images of his model. 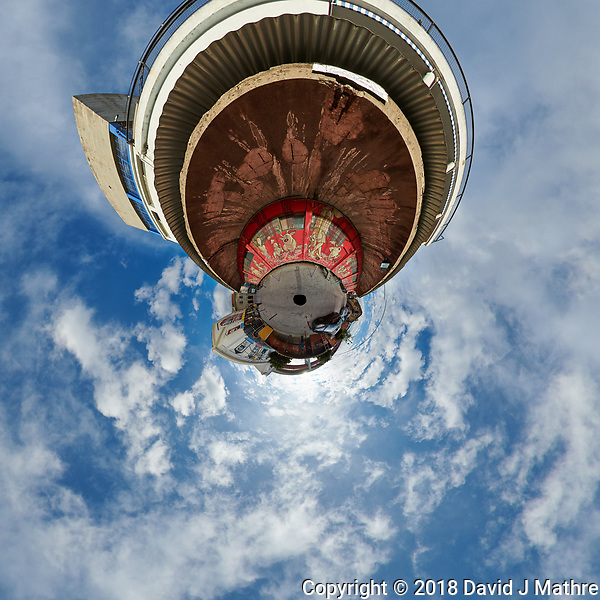 In addition to the street photography, I also took a series of images for a high-resolution composite 360 degree panorama and little planet view. I wish we stayed at the LX factory for dinner, and not return to the hotel. The 2nd taxi took a long time to return, so four of us went to a local Italian restaurant for dinner. 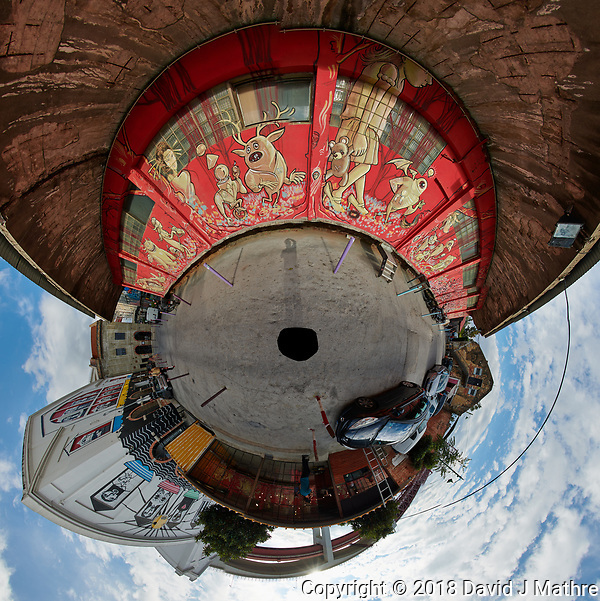 Time-Lapse Video (360 degree Pano, Tunnel View and Little Planet View) of the Afternoon LX Factory Walkabout. Images recorded with a Garmin VIRB-360 camera. Time-Lapse Video (360 degree Pano, Tunnel View and Little Planet View) of Dinner. Images recorded with a Garmin VIRB-360 camera. Gone to See Portugal. 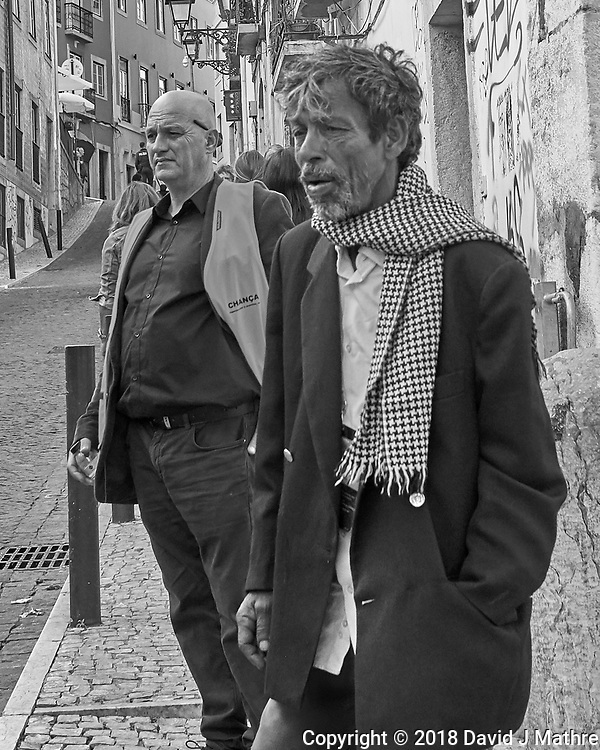 Street Photography Workshop with Steve Simon. Day 1: Lisbon, Portugal. I didn’t sleep well, as my two big toes were still sore after yesterday’s long walks. Yesterday I wasn’t wearing my walking boots, but rather the easy on/off shoes I wear when flying. That was a mistake. Finally, I just got up and worked on some images until going down for breakfast at 07:00. I used the Garmin VIRB-360 camera to record images for a time-lapsed video. Tunnel View and Little Planet View of Breakfast at the Bessa Hotel. Images recorded with a Garmin VIRB-360 camera. I didn’t go out for sunrise due to clouds and light rain. I also wanted to rest my feet some more. A little before noon, I went out to get some fresh fruit and a sandwich for lunch. It stopped raining and the sky was partly cloudy. I mounted the Garmin VIRB-360 camera on a short pole strapped to my backpack. That worked. With the little planet view the camera appears to be floating above me and behind my head with a 360 degree view of my surroundings. Little Planet View of a Walk to Pick Up a Sandwich before Class. Garmin VIRB-360 camera. Steve reserved a conference room a the hotel for our classroom and image review sessions. During our first classroom session the workshop participants met and showed examples of our work. We also got a schedule for the week with the proposed street photography shooting locations. After the classroom session, we went out on our first photo walk. I set up the Garmin VIRB-360 camera in my backpack to record the walk. 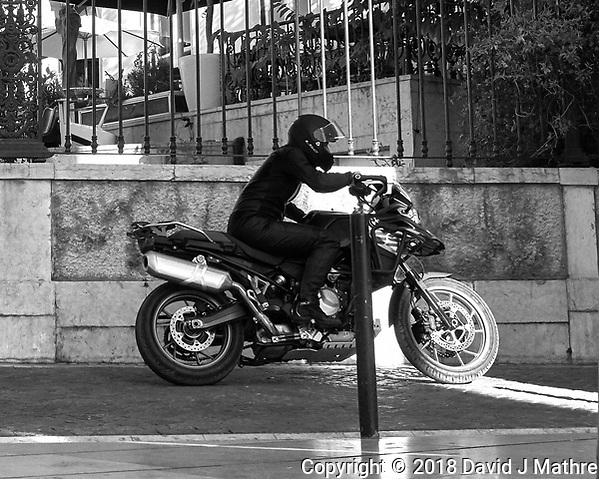 I chose to use my Leica CL camera with a 23 mm f/2 lens for my street photography. I set the camera to record and view the jpg images in B&W for this assignment. The raw (DNG) images would still be in color. We started out going down toward the river from the hotel. We soon broke up so we wouldn’t all be photographing the same thing and looking like a horde of paparazzi scaring people away. In this area of the city there are locals, and lots of daily tourists that arrive on busses from the cruise ships. Soon after we split up, it started raining. I stood under a shop awning and used the even lighting to capture moving bicycles, trams, and motorcycles. My two favorite images were abstract art in the hotel lobby before we started, and a couple under an umbrella. Little Planet View of the Afternoon Street Photography Walkabout. Garmin VIRB-360 camera. The group got together for a traditional Portuguese dinner of Bacalhau (dried and salted cod). I’ve seen the cod drying on racks out in the open while visiting Norway. The salted and dried cod can be stored for years, and is one of the foods that the Portuguese used in their sailing ships while exploring the world. It is also common in Brazil and parts of Africa. The Bacalhau needs to be soaked in water for a long time before it is cooked. The Bacalhau we had at the restaurant was still a bit salty, but an excellent meal. Tunnel View and Little Planet View of Bacalhau for Dinner. Images recorded with a Garmin VIRB-360 camera. 360 Degree Panorama View of Bacalhau for Dinner. Images recorded with a Garmin VIRB-360 camera. Gone to See California. Day 6: Death Valley Spring 2011 Photography Workshop with Michael Mariant. 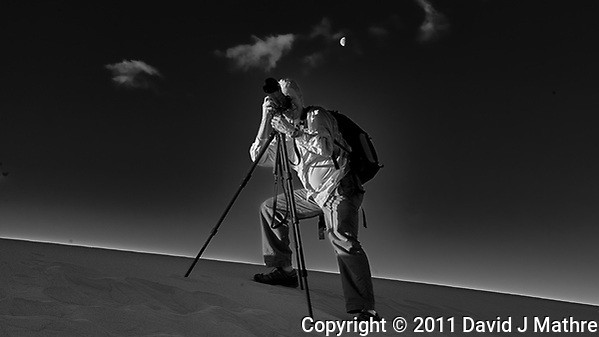 On the second day of the workshop we started the day before sunrise at Mesquite Flats Sand Dunes. Fortunately, this was not very far from Stove Pipe Wells where we spent the night. We did have to hike in the dark from the parking lot to the sand dunes. This was the reason Michael had geomarked the trail the day before. If you are going to do this remember to bring along a flashlight or headlamp, and watch out for sidewinder rattlesnakes It also was a bit chilly out. 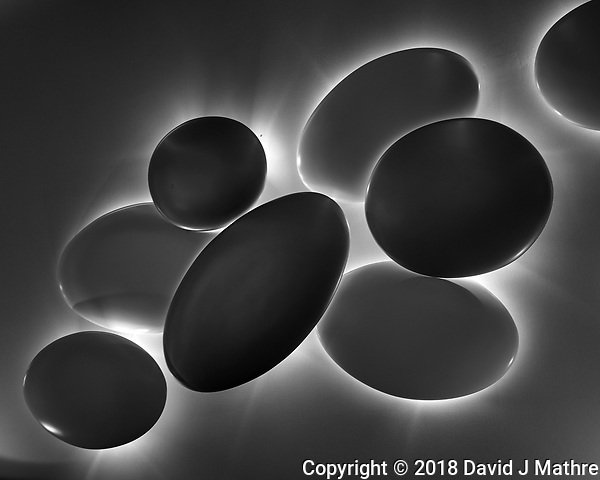 All of the images have been re-processed with Capture One Pro, including conversion to B&W.